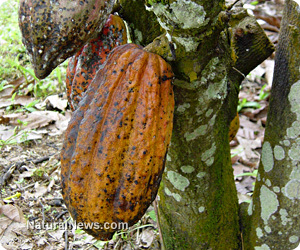 (NaturalNews) Cacao has been a super food secret that's been revealed more and more lately. Cacao is the essential ingredient of chocolate. It can be purchased as a powder or nibs and mixed into coffee or milk to get the maximum polyphenol flavonoids that offer many health benefits. But don't let this lure you into eating all sorts of chocolate candies. The more cacao is processed into consumer chocolate candies, the less healthy and even potentially unhealthy the end product becomes. In order to obtain maximum health benefits, use either cacao powder and nibs or the darkest organic fair trade chocolate bars you can find. It's recommended to get chocolate that's at least 70 percent cacao without milk and with very little sugar. You'll have to get used to the bitter or bittersweet taste, which is not so difficult. Processed milks and sugars will not make you healthier. But what's cool is it only takes 200 mg of cacao daily, which equates to 10 grams of dark chocolate or 2.5 grams of high-flavonol cacao powder as part of a balanced diet. That's less than an ounce. Less than a daily ounce can improve cardiovascular health and reduce the risk of heart attacks and strokes. This is what the European Food Safety Authority (EFSA) concluded earlier in 2012, after some serious lobbying and research from the world's largest producer of raw, bulk chocolate, Barry Callebaut of Swiss-based Callebaut Chocolate. (1) Well, the obvious factor is that it promotes blood flow to prevents blood platelets from coagulating and creating embolisms. Embolisms are particles in the blood stream that will clog a heart, brain, or lungs. Bye-bye dangerous statins. German research also discovered it lowers blood pressure as well as pharmaceuticals normally prescribed for hypertension. All that's missing are the adverse side effects. (2) Cacao or dark chocolate's polyphenols reduce the risk of colorectal or colon cancer. The Science and Technology Institute of Food and Nutrition in Spain determined this and published their findings in the journal Molecular Nutrition. (3) Pure cacao antioxidants rank among the highest ORAC (oxygen radical absorbance capacity) ratings of all foods, even much higher than Goji berries. Antioxidants reduce cell damage and help prevent a multitude of diseases, including Alzheimer's and cancer. (4) Cacao and dark chocolate help improve sugar metabolism. This is one yummy diversion that won't promote diabetes. It may even help prevent diabetes, according to an Italian study. (5) Because of cacao or dark chocolate's biochemical content of caffeine and phenylethylamine as well as the increased blood flow in the brain, mood is elevated. A small, daily portion, one and a half ounces, of 85 percent dark chocolate helped sufferers of chronic fatigue overcome their woes. Now you have several real health reasons for enjoying a little high quality dark chocolate or cacao every day.